Let’s face it folks – we’re in a world dominated by technology. We spend endless hours in front of computers, cell phones, video game consoles, and steering wheels. As a result, there is a cumulative effect of bad posture that leads to neck and shoulder pain as well as low back pain. This is particularly a challenge for people that sit in front of a computer all week doing their job. Correct computer posture practices will help reduce pain and allow you to get through your work day without those nagging aches and pains. 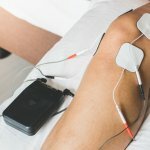 The physical therapists at SSOR are here to help you not only with the “tricks of the trade” to improve your posture and ergonomics, but we’re also especially astute at helping to reduce and often eliminate pain associated with those long work days in front of a computer. What does proper computer posture look like? The figure below provides a good visual as to what correct sitting and correct computer posture should look like. 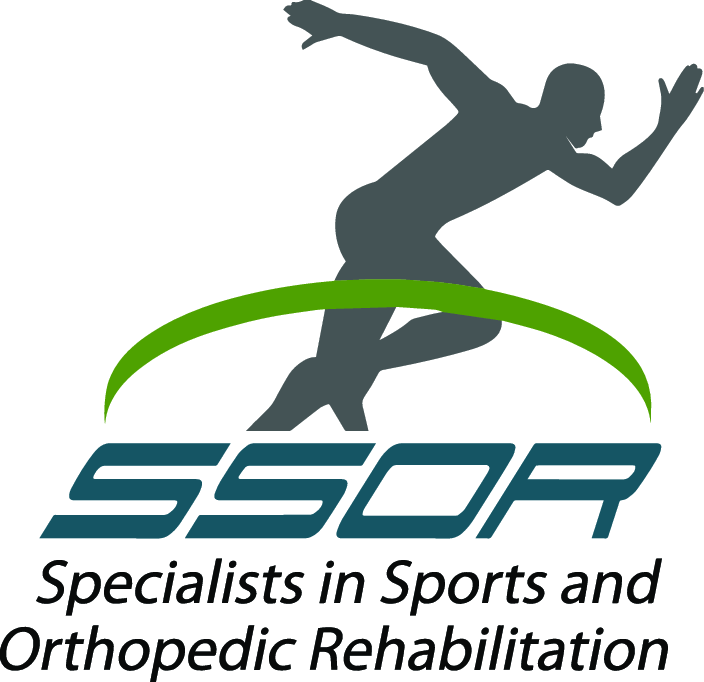 At SSOR, we instruct our patients to try and get their knees below their hips when they sit. You can do this in three ways: scoot to the edge of the chair and tuck your legs under you, straddle the chair, or fold a pillow in half and sit on it, similar to a booster seat. What these positions allow is for you to keep your “curve” in your low back as well as reduce slouching above. If you slouch with your knees below your hips, you’ll fall out of the chair! Another key component of correct computer posture is monitor placement. It should be either slightly below eye level, or you should be slightly above it. What this does is keep the correct “chin tuck” posture in the neck. Poor posture with slouching causes the head to move forward and results in neck and shoulder pain as well as headaches. One final point that is critical – keep that mouse close to you. When your mouse is way out in front of you, your arm is effectively reaching for several hours a day. Imagine if you just held your arm in the air in front of you for hours – it will start to hurt and ache right? Well, having the mouse way in front of you does the same thing. Plus, it puts tension on the nerves that come out of the neck and innervate the arm and hand muscles. Eventually, this causes pain and potentially numbness and tingling in the neck, shoulders, and arm. There are a few things you can do while sitting to help you if your back/neck starts to ache. You can do “chin tucks”, which is basically a “nodding” motion. Chin tucks reinforce that proper neck posture discussed previously. Secondly, you can take rest breaks every 10 minutes or so – just stand up and move around for about 30 seconds or so just to provide your body with a “change” in position. Third, you can “rock” your hips side to side in your chair to help change pressure on your back. Last, you can squeeze your shoulder blades together every 10 minutes or so, about 30 times or so, to combat that upper back achiness. The foam roll is a great tool for the end of the day aches. 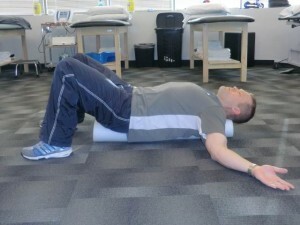 Figures 1 and 2 below show how you can use the foam roll. In Figure 1, just lay lengthwise on the foam roll for 15 minutes or so after work when you get home. This feels divine after a long day. In figure two, place your hands around your neck to support it and make gentle, oscillating arching motions with your back. Again, this counteracts the bad posture you may be doing throughout the day. Figure 3 shows a nice doorway stretch you can do for your shoulders that also reverses that slumped position and stretches out the chest and shoulder muscles that have been short all day. If you’re battling neck, shoulder, arm, or low back pain that seems to be worse at the end of the day and aches like crazy, the physical therapists at SSOR are here to help. Give us a call and let us help you make your day more manageable. It would be a privilege to serve you!